StatCounter sends out word that for the first time, 1366 x 768 is the most widely used monitor resolution on the web. A major milestone in screen resolution sizes has been passed according to independent web analytics company, StatCounter. The company's research arm, StatCounter Global Stats reports that for the first time 1366x768 has become the most popular screen resolution worldwide, having overtaken 1024x768. "The data reflects a continuing trend of users moving to larger screen resolution sizes," commented Aodhan Cullen, CEO, StatCounter. "The screen resolution size people are using is a critical factor for developers when it comes to web design, particularly in the case of fixed width web pages." 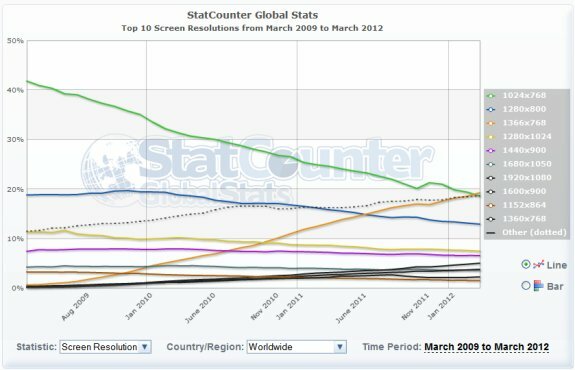 Since StatCounter began its tracking of screen resolution in March 2009, as a free service to developers and other users, 1024x768 has been the dominant screen size globally on the web (excluding mobile*). 1024x768 has fallen from 41.8% in March 2009 to 18.6% in March 2012. Over the same period 1366x768 has grown from 0.68% to 19.28%.The third most popular size is 1280x800 at 13%. Cullen also said that while StatCounter Global Stats provides information on worldwide and regional trends, monitoring the specific screen resolutions being used to view individual sites is also very important. StatCounter (http://statcounter.com/) provides free website traffic analysis. This allows web developers to capture screen resolution stats on their own and on their client websites in real time. Other information available includes search terms, download stats, exit links and other data. StatCounter Global Stats data is based on over 15 billion page views per month (4 billion from the US) to the StatCounter network of more than three million websites.